During many of our club’s tours across the Hypergrid, we encounter hiccups. 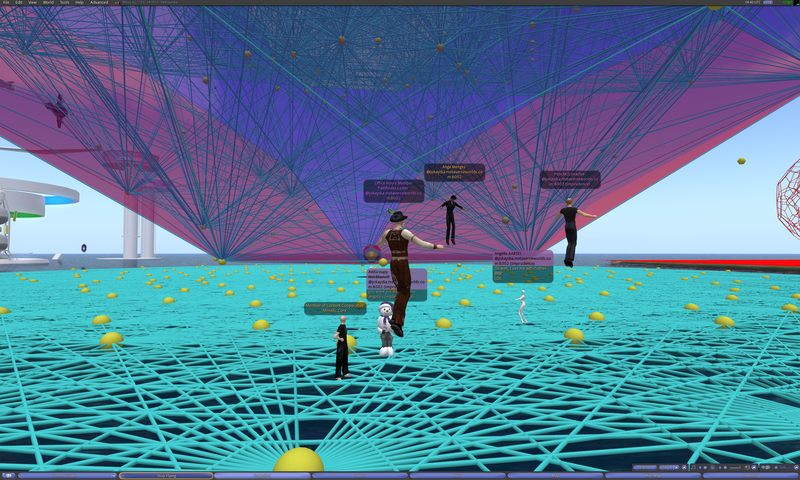 Such is the nature of new frontiers like the Hypergrid and the evolving nature of Opensim. As a group, we all do our best to take these bumps in stride, regroup with enthusiasm, and venture onward. But at this particular meeting, almost everything that could go wrong, went wrong. I was reminded of a line from The Big Lebowski. Firstly, the new hypergate I installed sent people to the wrong region. And when people finally made it to the region we were supposed to visit, it crashed shortly after we arrived. The faulty hypergate jump was entirely my fault. I didn’t configure it properly. Why the region Wizzy crashed was probably caused by a combination of variables. 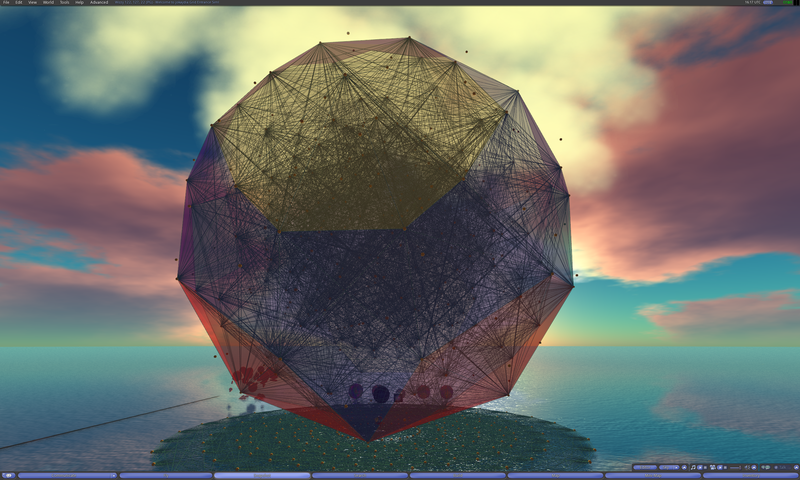 There were 9 of us entering Wizzy via the Hypergrid, and Hypergrid connections can often stress an Opensim region more than a local grid avatar connection. 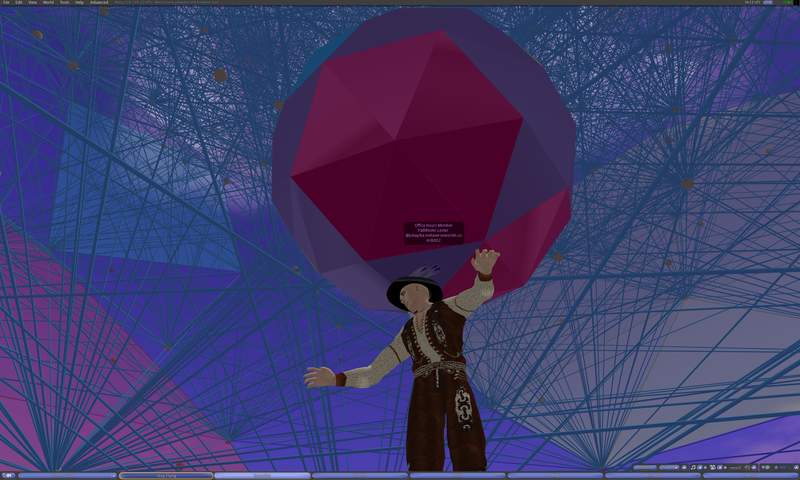 Add to that the fact that Wizzy is full of complex giant geometric models with thousands of prims, that it’s not currently being run on a dedicated server, and that I think the region had not been rebooted in a long time, and you get a recipe for wackiness. My apologies to everyone on the tour (especially to those of you who were attending our club meeting for the first time), and my sincere apologies to Wizard Gynoid for crashing her region. 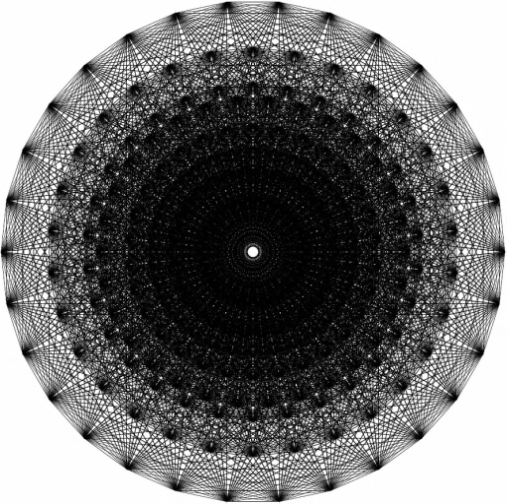 Despite all this, I think we had a good discussion at our meeting and a fun (albeit abbreviated) exploration of an amazing geometric model. Please be sure to revisit the region Wizzy in the future. It is simply stunning and worth the trip. Pathfinder Lester: how’s everyone doing this morning? Marmottina Taurog: Good ty ! Pathfinder Lester: very cool Marmottina. do you have plans yet for it? Pathfinder Lester: we have some new folks here, i see. welcome! Marmottina Taurog: TY path ! I always forget that ! Marmottina Taurog: Hopeless self-publicist ! Marmottina Taurog: Ty Angelle ! Pathfinder Lester: Pete, you’re involve with EduNations, yes? Marmottina Taurog: Cool Neo ! Marmottina Taurog: Rgrid is a good place to be ! Angelle AARISS: Awww, , Thanks, Neo ! Marmottina Taurog: Hi Ange ! Marmottina Taurog: how does it work ? Marmottina Taurog: via a web site ? Marmottina Taurog: oh cool ! Pathfinder Lester: then type in local chat “/45 whatever text you want” and it appears! Marmottina Taurog: I drew a blue line ! Pathfinder Lester: Marmottina, there you go! Ange Menges: Path may I ask for some help ? Pathfinder Lester: Ange, sure. what can i do for you? Marmottina Taurog: What time does it start Ange ? Pathfinder Lester: Ange, my pleasure. I will work to spread the word more. Marmottina Taurog: yes OK how long is it ? Pathfinder Lester: great. thank you. Pathfinder Lester: I can’t wait for this one! Pathfinder Lester: the magic flute! 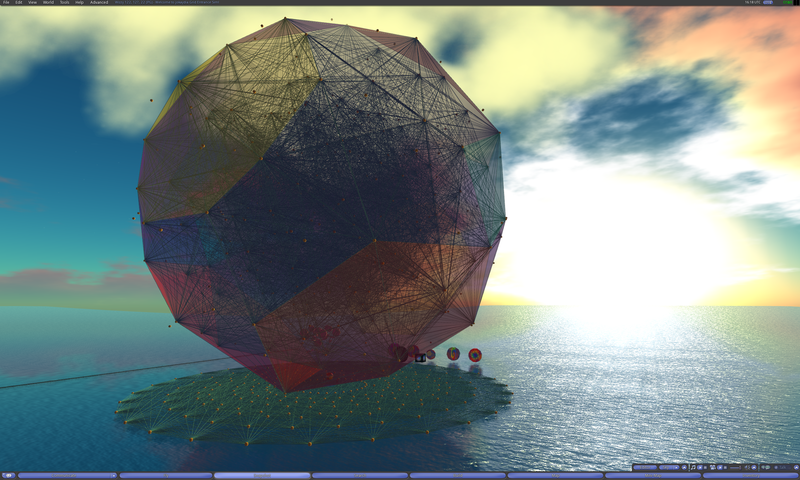 We could make this single Hypergrid Jump the manual way, but I thought we’d try something a bit more fun for today. I recently found a beautifully detailed Stargate artifact on FrancoGrid. It seems to be designed like the Stargates often found in Second Life, allowing people to make normal teleports to different regions. 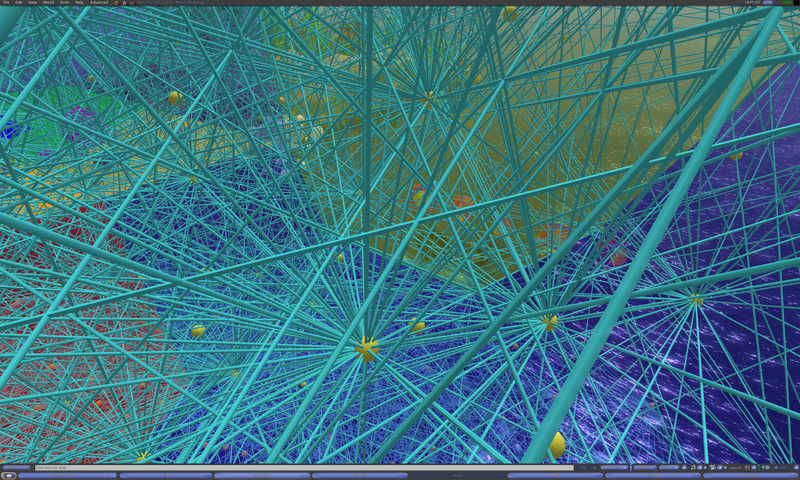 But I discovered that I could get it to work with Hypergrid addresses. I have programmed and placed one of these Stargates to the SouthEast of our fire circle on Pathlandia. It’s quite large, so you can’t miss it. The Stargate will then go through some animations and finally a portal will appear. 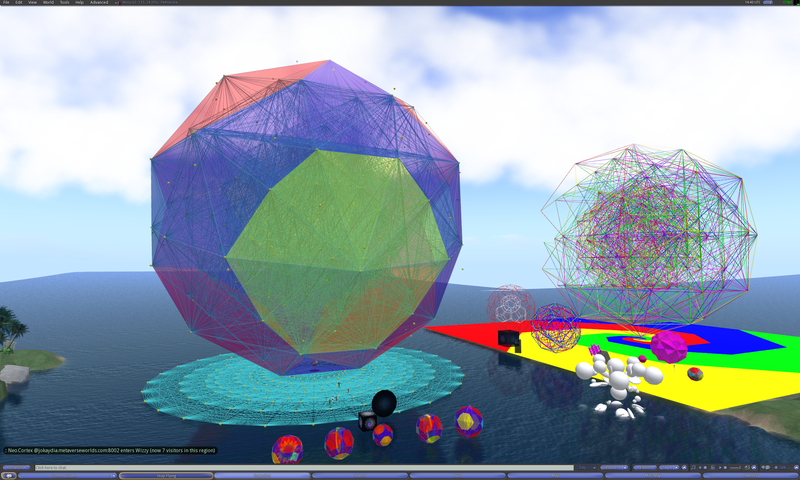 Walk through the portal and you will make a hypergrid jump to the region “Wizzy” on ReactionGrid. 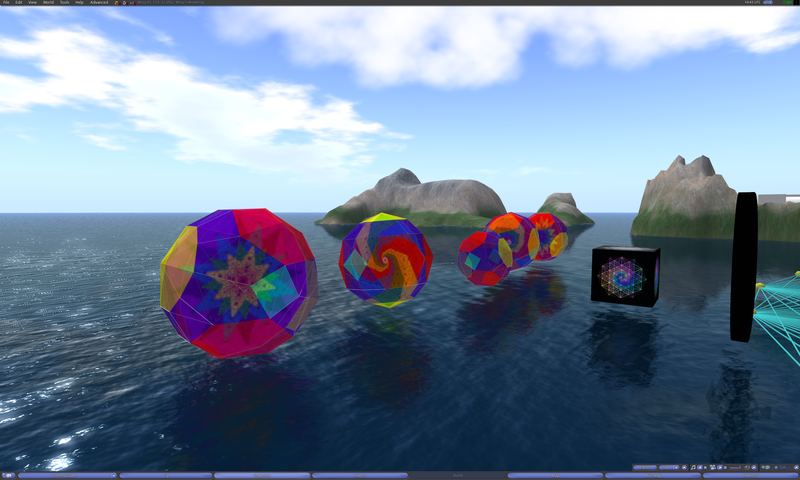 From her blog: “I live to build and I seem to specialize in building complex and precise geometric objects. Lately I’ve been exploring other dimensions of reality — like the fourth and eighth dimensions.” On Wizzy’s region (named, appropriately, “Wizzy”) we’ll find some of her beautiful and hugely complex geometric creations. Pathfinder Lester: before we start our jumps, Pete, have you set your home location yet here on jokaydiagrid? Pathfinder Lester: Before doing any Hypergrid jumps, be sure you have set your Home location and have relogged since you set it. If you don’t, Hypergrid jumps will not work. Pathfinder Lester: and we’ll be making just 1 jump today. jumping from here to ReactionGrid. Pathfinder Lester: Neo, how so? Neo Cortex: what if the copyright owner steps up and tells us to remove them? Pathfinder Lester: itsn’t it great? Mel Blauvelt: something’s coming through our way! We activate and walk through the Stargate-inspired hypergate on the region Pathlandia on jokaydiaGRID. And we arrive on the region Wizzy on ReactionGrid. Pathfinder Lester: the Stargate also points to Permutation. it must have reset or something. Ange Menges: Path is this a module ? Or did she made this with a script ? Pathfinder Lester: here’s a notecard dispenser that gives more info about what we’re looking at. On the surface of the water we see the object in two dimensions. Rising above it, and perfectly aligned to it, is the 3 dimensional projection. 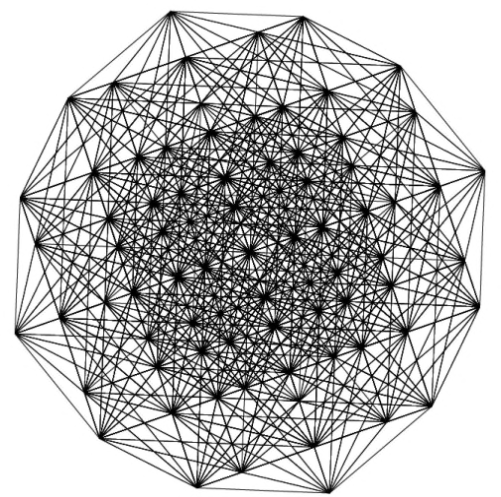 This object consists of all 240 vertices, with 6,672 edge struts connecting all of the vertices. A “tunnel” runs vertically up and down through the object. You can fly through this tunnel by walking to the center of the sim and flying straight up vertically. 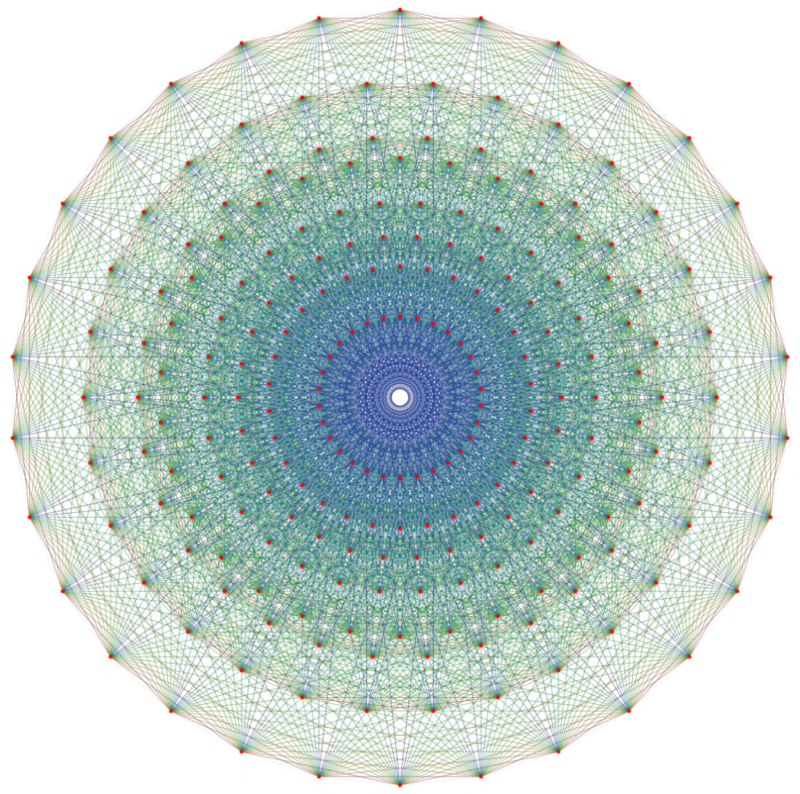 The outside “skin” of the object has been rendered in colors that identify the symmetry axes. Yellow identifies the pentagohedral/decahedral symmetry axis. Red identifies the hexahedral symmetry axes. Light blue identifies the quadraghedral symmetry axis. Pathfinder Lester: the server might need a reboot, too. might not have been rebooted for a while. At this point the region crashed. But we’ll be back to explore more. 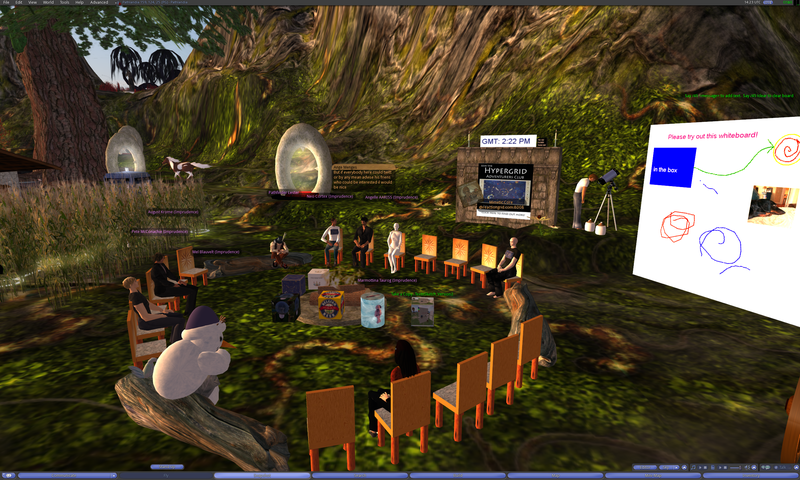 And so ends another meeting of the Hypergrid Adventurers Club. Until next time. 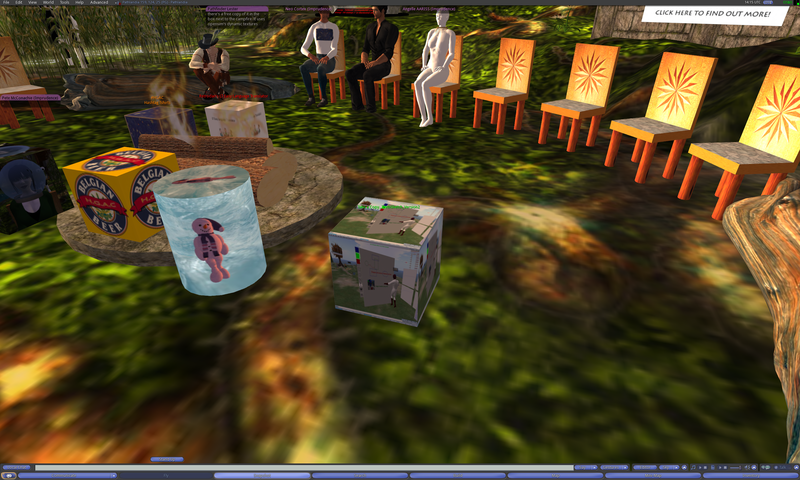 This entry was posted in Announcements, Education, OpenSim, Virtual Worlds and tagged avatars, education, geometry, HyperGate, HyperGrid, Hypergrid Adventurers Club, jokaydiagrid, mathematics, metaverse, online communities, OpenSim, ReactionGrid, virtual worlds by John "Pathfinder" Lester. Bookmark the permalink. Cool stuff!- just been mooching through a wonderful new publication of the ‘Quadrivium’; ISBN: 9780802778130 and Zenith`s latest translation of Pessoa`s `Book of Disquiet` when I took a break and fell upon your page. Nice to see your beautiful works and joyful chats! Thanks. Rho – (more fun than Phi or Pi).